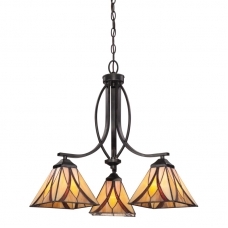 Inspired by the original pieces designed for the Grove Park Inn, the Asheville Chendelier features a timeless design of rolled art glass in a beautiful blend of subtle jewel tones and soft autumn tones. 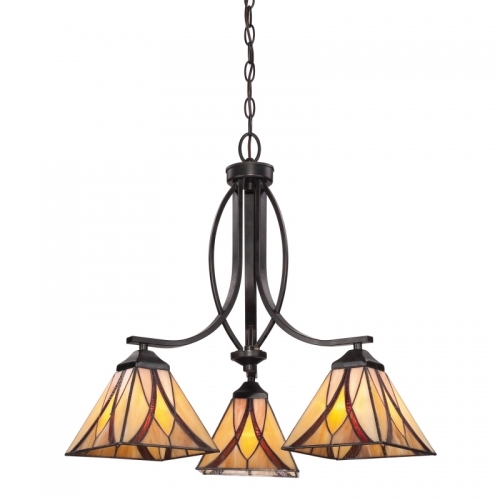 A rich Valiant Bronze finish brings depth to the open-concept fixture that perfectly complements the three shades. Perfect for your dining room, den, or foyer. At Mission Bungalow we bring you only the Highest Quality Lighting, be it Tiffany or otherwise. We have 33 years of experience in the design, construction, crafting and packaging of Lighting and Stained Glass in particular. Every piece is personally assessed before it makes the cut and goes into our inventory or on our site, insuring exacting quality and a Lifetime Electrical Warranty. All of our Tiffany items use Hand Rolled Art Glass, individually cut, using the Copper Foiling method used by Tiffany Studio over 100 years ago. At Mission Bungalow. "We sell what we own and we own what we sell".